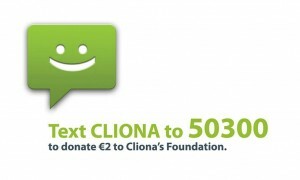 Cliona’s Foundation are always delighted to hear back from families we have supported on the importance of our assistance to them but also to understand what they are going through and how their child is progressing. Baby Shannon was born in June 2016 and immediately transferred to Our Lady’s Children’s Hospital Crumlin where she was diagnosed with a rare and complex heart condition that will require ongoing monitoring, treatment and major surgery. She remains an inpatient in the hospital and will do so for several months to come. Shannon’s mother has stayed with her throughout her admission staying in Ronald Mc Donald House at a charge of €20 for the first 7 nights and €10 per night thereafter. Shannon’s Dad stayed in Dublin for the first few weeks of her life but has since returned home. He had to return to Crumlin to stay when Shannon has deteriorated on several occasions. Her dad is self -employed so obviously when he is up in Dublin there is no income for the family. Where possible he works during the week while looking after Shannon’s 2 older siblings with the assistance of extended family. Given these circumstances the family have been under huge financial pressure with the costs of travel, accommodation, expenses and the usual household bills mounting. “I am writing to thank you so much for your cheque. 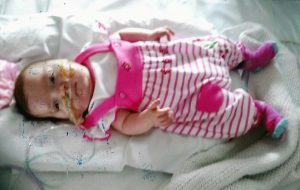 Since our beautiful baby girl was born things have been extremely difficult emotionally, physically & financially. Shannon has been in Crumlin since she was born and in the New Year when she’s as big/strong as possible will be undergoing life threatening and life changing surgery. Shannon’s heart condition is extremely rare and complex. We nearly lost her on numerous times and during those times bills were the last things on our minds. Things started to get on top of us as bills kept piling in.